ESA's Mars Express spacecraft orbits the Red Planet in a highly elliptical, polar orbit that brings it close to Phobos every five months. 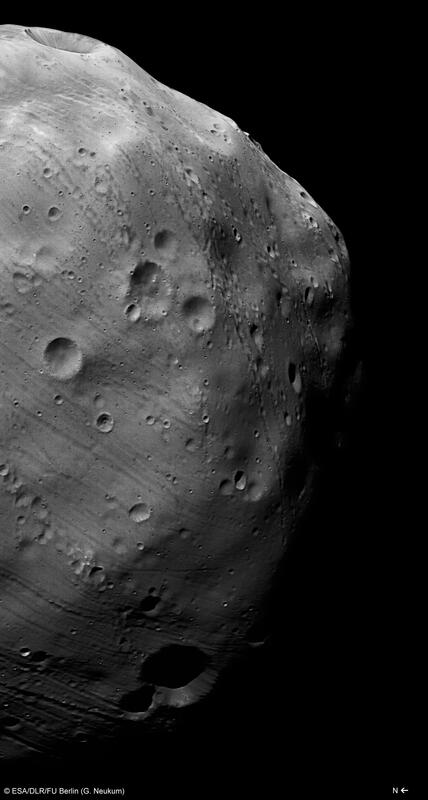 It is the only spacecraft currently in orbit around Mars, whose orbit reaches far enough from the planet to provide a close-up view of Phobos. 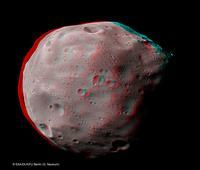 Like our Moon, Phobos always shows the same side to the planet, so it is only by flying outside the orbit that it becomes possible to observe the far side. The other spacecraft presently orbiting Mars do so at much lower altitudes, and therefore only see the planet-facing side of the moon. NASA's Mars Odyssey (MO) and Mars Reconnaissance Orbiter (MRO) are in a low orbit around Mars and will never get as close to Phobos as Mars Express. The High Resolution Stereo Camera (HRSC) onboard the ESA spacecraft Mars Express took the images for this stereo composite of the surface of the moon Phobos on 7 March 2010. Due to the stereo viewing geometry during the flyby a small part of the moon's edge is only visible for the right eye resulting in odd 3D-perception in this area. Image data were taken from a distance of 130 km with a spatial resolution of about 4.4 meters per pixel in orbit 7915. In 2011/12 the Russian Federal Space Agency will send a mission called Phobos Grunt (meaning Phobos Soil) to land on the Martian moon, collect a soil sample, and return it to Earth for analysis. For operational and landing safety reasons, the potential landing sites for this spacecraft were selected on the anti-Martian side of Phobos within the area 5°S-5°N, 230°-235°E. 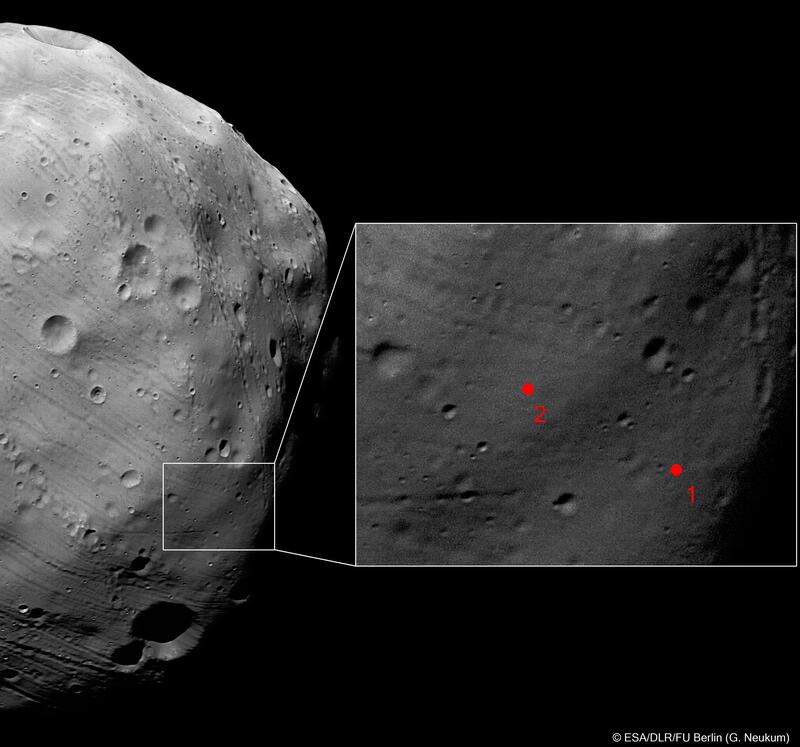 This is why new HRSC images showing the vicinity of the landing area with higher resolution or other improved sightings such as a real coverage or sun lighting conditions than during the previous flybys (July-August 2008) of Phobos by the Mars Express spacecraft are so interesting for mission support. 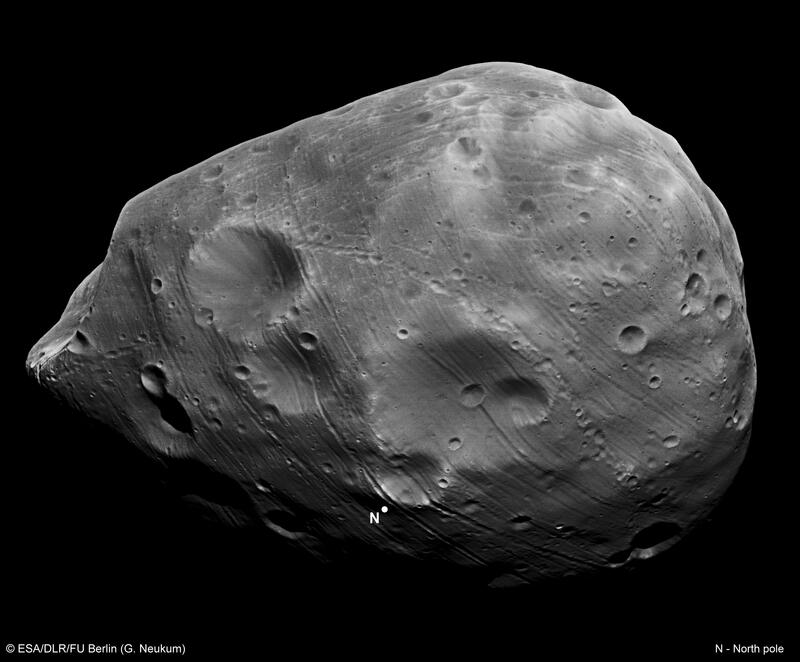 HRSC nadir-channel image of Phobos with a resolution of 4.4meter per pixel in Orbit 7915. 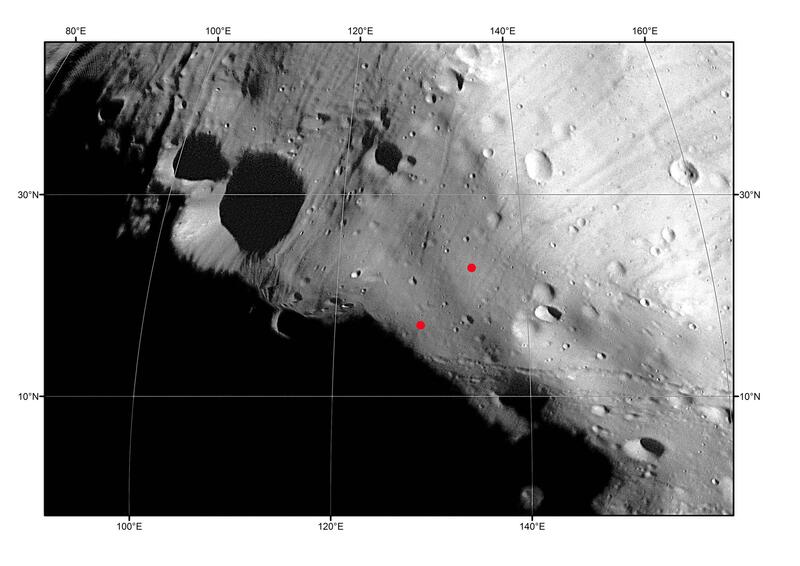 The blown-up portion of the image shows the proposed landing sites (S1, S2) for the Phobos Grunt spacecraft. The irregular 27 km � 22 km � 19 km body will be imaged at each pass by the High Resolution Stereo Camera (HRSC) (also partly images taken by the SRC with a 4.3 fold higher resolution) with the exception of the closest flyby on 3 March. This pass is devoted to high-precision determination of the gravity field of Phobos by Doppler tracking by the MaRS experiment and all other experiments will be shut off for avoiding any interference. The origin of Phobos is debated: it appears to share many surface characteristics with the class of carbonaceous C-type asteroids, which suggests it might have been captured from this population. However, it is difficult to explain either the capture mechanism or the subsequent evolution of the orbit into the equatorial plane of Mars. An alternative hypothesis is that it formed in its present position, and is therefore a remnant from the planetary formation period. This image has additionally been enhanced photometrically for better bringing out features in the less illuminated part. All images are contrast-enhanced and geometrically adjusted for flight movements. Resolution: about 9 meters per pixel. 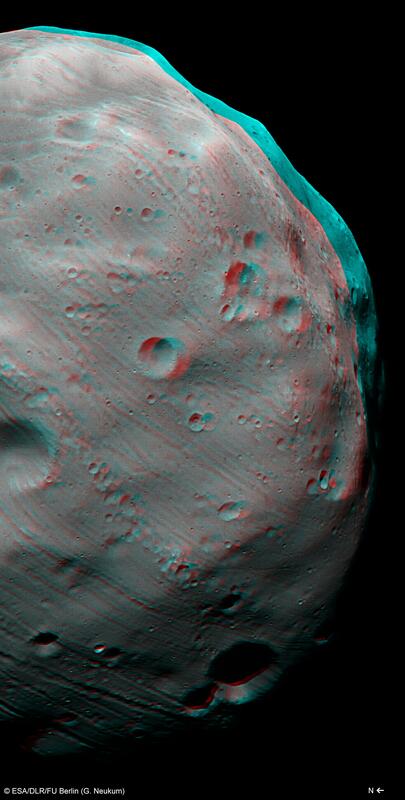 The High Resolution Stereo Camera (HRSC) on board the ESA spacecraft Mars Express took the images for this stereo composite of the surface of the moon Phobos on 10 March 2010. The image data were taken from a distance of 278 km with a spatial resolution of about 9 meters per pixel in orbit 7926. All images are contrast-enhanced and geometrically adjusted for flight movements. The anaglyph has also been slightly geometrically adjusted at the left rim of the Phobos image to correct for viewing conditions. Image: Copyright ESA/DLR/FU Berlin (G. Neukum).